A new dawn for Scotland? There is an interesting contrast to the loss of the chief executives at the Scottish Rugby Union (SRU) and the Rugby Football Union (RFU). With John Steele squeezed out of the Twickenham in a power struggle with the blazers, it fell to his predecessor Francis Baron to predict a total and utter meltdown of the Twickenham organisation on a scale only rivalled by Greek banks. Meanwhile, in Scotland, the fact that Gordon McKie was finally persuaded to walk the plank exactly five days after an unanimous vote of confidence from the SRU board was met with a shrug of the shoulders; a long way from the hue and cry that was raised when Phil Anderton was shown the door by the Murrayfield "bufties" back in 2005. Why the insouciance? The first thing is that the SRU's finances have been sorted although by sorted I don't mean the debt has vanished, rather the leaks have been plugged and the good ship Scottish Rugby is no long listing like a sailor on shore leave. In his six years at Murrayfield, the SRU never once posted a meaningful profit because any excess cash was used to upgrade the stadium. However the overall debt has still fallen thanks to clever accounting such as advance booking of ticket sales and the such like. The SRU is not exactly a cash cow to be milked dry but at least it isn't losing money hand over fist. McKie is a company doctor who specialises in cutting costs and he has been very thorough. There was even talk of a player strike after the Rugby World Cup because of the squeeze although there are plenty of them who earn far more in Scotland than they would elsewhere. But McKie fell down in two specific areas. Firstly he had an uncanny ability to rub people up the wrong way; he was aggressive and abrasive in equal measure although friends of his insist he is good company over a pint. When the squeeze came on there were few who leapt to defend the boss. More important was his inability to grow Murrayfield's revenues sufficiently and as a result the Union ended up paying the vast majority of the pro-teams' bills. Anywhere else in the world central funding is augmented by sponsors, well-wishers, sugar daddies, broadcasters, sales of shirts/beer/hotdogs and crucially fans paying at the turnstile. Scotland's pro-teams had too few of all the above categories but especially the latter because without fans very few of the other things come together. In the year before McKie joined the SRU, Edinburgh Rugby boasted (if that's the right word) average crowds of 2,719 and last season, after six years of McKie's running the show, that figure had grown to 2,990. The numbers equate to an increase of 271 people over six years or 45 extra fans per annum. At this rate of progress McKie could hang around Murrayfield until he retired at 65 and Edinburgh would still only average crowds of 3,500 odd thousand. It's progress I suppose but not the sort that you'd really want to boast about. The result of all these cuts and the lack of significant revenue growth from other areas meant that Edinburgh and Glasgow continually lost their best players abroad. Two years ago Glasgow made the Magners League play-offs, which was a laudable effort but just when they were on the cusp of putting together a competitive squad they lost half of it. Thom Evans suffered a career ending injury, Kelly Brown went to Saracens, Mark McMillan to Bath, Dan Turner to Japan, Dan Parks to Cardiff, Richie Vernon to Sale, Tim Barker to Ulster, Max Evans to Castres and there are precious few who believe that the giant lock Richie Gray will stay when his contract expires in one year. Glasgow finished just one place off the bottom of the league last season and coach Sean Lineen is now fighting for his job...yet the mood in Scotland in surprisingly upbeat. Admittedly we have wasted much of the last six years but it's never too late and there is a genuine and very real appetite for change right now in Scotland especially with a new man at the helm. 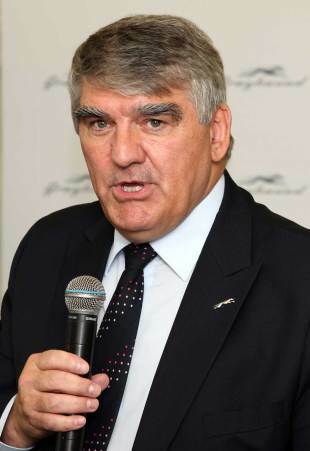 Sir Moir Lockhead took over as chairman of the SRU on June 24. The man who transformed First Direct transport group from a local Aberdeen bus business into a transport giant that carries 2.9m million people every day can maybe do something similar for Scottish rugby. He has been attending board meetings for several months now to familiarise himself with the inner workings of the Union. Sir Moir started his life as a mechanic and he still likes to roll up his sleeves and get involved in the day to day nuts and bolts of running Murrayfield. This hands-on role was never going to sit comfortably with McKie's propensity to micro-manage every aspect of the Union's business. The first thing Lockhead will have to do is replace McKie and here's where it gets really interesting. Scotland have already poached one Englishman in Andy Robinson who proved an inspired signing. Might the SRU be lining up another in the form of John Steele? He is good friends with Robinson, Steele's father was Scottish and the former RFU boss might like the opportunity to stick two fingers up at the Twickenham "blazers" by working for the old enemy.